Alcatel is a French mobile company that was created in 2004 and was a joint venture between Alcatel- Lucent of France and TCL Communication of China. The firm has targeted the American mobile market, mainly producing entry level smartphones and tablets. Alcatel unveiled the world's thinnest smartphone, the Alcatel One Touch Idol Ultra and announced the ONE TOUCH Fierce and ONE TOUCH Evolve with T-Mobile, earlier this month. In September, it also unveiled the One Touch Evo 8. This is a tablet with an eight inch display featuring 1024 x 768 screen resolution. It is powered by a 1.6 GHz dual-core processor and has 1GB of RAM. The device sports a dual camera with 3 megapixels in the rear and 2 megapixels in the front. In addition, the device stores data up to 4GB but can be expanded up to 64GB via microSD cards. 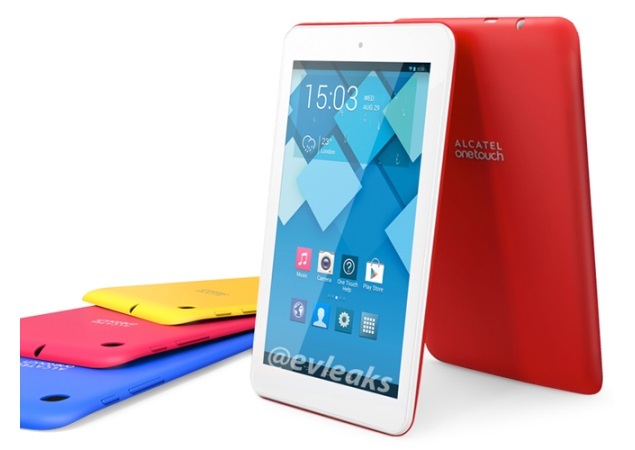 According to a recent leak from @evleaks on Google+ feed, Alcatel is set to launch a seven inch tablet. This would be the One Touch Pop. Unlike the information that I am able to give you for the eight inch tablet, there is only one piece of information that I can impart upon you from the @evleaks leak. What is this ground breaking piece of knowledge? It is colorful. Really, that’s about all that I can tell you. There are rumors that the One Touch Pop would feature a sleek form-factor. This is not surprising considering it already has the thinnest smartphone. It will be running on the Android platform, however it is an unidentifiable version of Android OS. The display of the unsubstantiated One Touch Pop tablet can be seen in the image below with Alcatel's smartphone UI. You can see it also houses Google Play store. Also, you can see that it is a two-tone design. It appears that the front will sport a rather large white bezel with rounded corners. The back will feature what appears to be the company and device name. The back will also feature several bright colors in contrast with the white front.